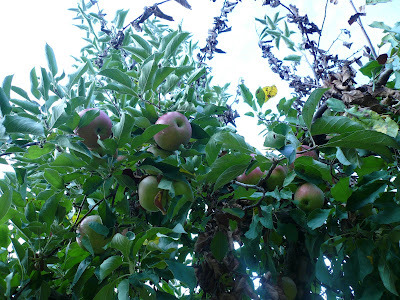 My Kitchen Snippets: Apple Picking!!! Nancy and I went apple picking over the weekend. Been in this country for so many years but this is my first time picking apples. We went to Linvilla Orchard which is about 25 minutes drive from our home. Went there really early and we are the first batch of people to arrived there. 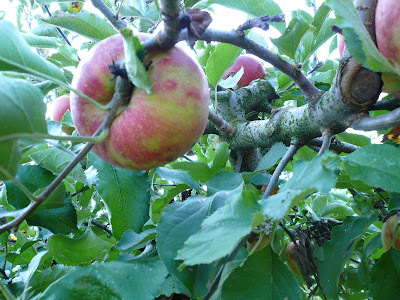 At this time of the year there are no too many varieties of apple left. 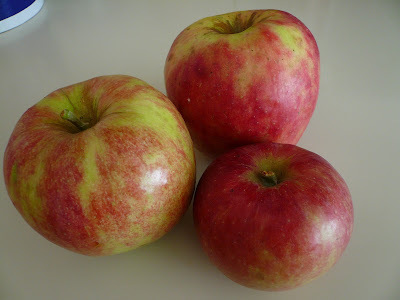 There are Gala, Mutsu, Golden Delicious and Jonagold. 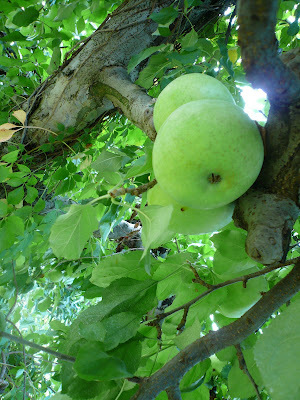 No much apple left on the trees either and what was left were too high for us to reach. At one point Nancy had to climb up the trees to get the apples. Anyway, we had a great time walking around, tasting and choosing the apples. My favourite is Jonagold which is really sweet. 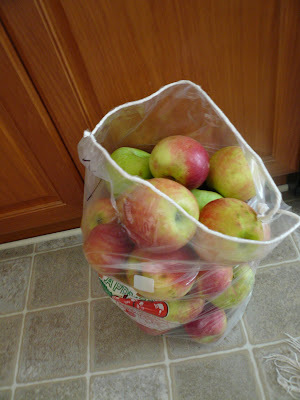 Now I have to figure out what to do with the 10 pounds of apples. OMG! Geramnya tengok banyak apple! Eh! Mana pergi gambar you panjat pokok? I think they didn't let you petik there takut the pokok tumbang. The pokok look so thin. Thank you for sharing. Did you have a great time? Zue is SO funny! 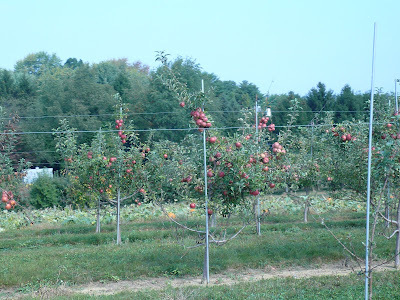 I think they didn't allow you to pick those apples because they are younger trees in the fruit thinning stage. We planted one last year that bore a dozen apples last year. The nursery advice to prune and thinned so that the next harvest is better. This year ZERO fruit! Sigh. How did you end up with a 10lb bag, Gert? Is the the standard per person? Bikin apple pie Gert... Or if you really ran out of idea, buat apple juice aje lah... HEHEHE. Rita, there are two choices. A 5 pound or 10 pound bag and we pick the 10 pound and paid $20 each for it. We get to fill the bag up with any apples. 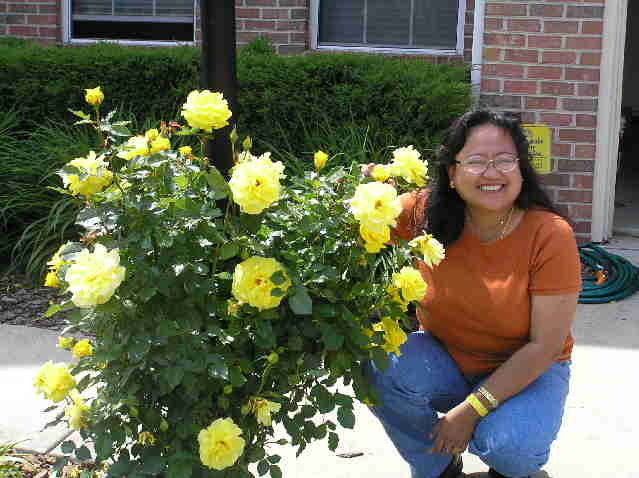 Retno & Cat, I bake tarts today and going to make some juice for breakfast tomorrow. Thanks for the suggestions. Great to know tht you had a great time :) I'll be going to an apple orchard too next week with Amira .. and btw Gert how about making some apple crumble ? .. I love apple crumble! ..
Gert..at last you're at apple picking!! fun right?.I think,they don't let you pick some trees,maybe reserve for themself.Anyway,I saw many recipe out there cook apple with meat beside making dessert...Casserole chicken with apple.I saw that recipe in H & G mag. Envy, I thought of apple crumble too. Going to make some. Have a good time with Amira at the Ochard. Watch out for the bees. Plenty of them. Wow that is what i call a big heap of apples. SO what are you going to make with it. yelah, mana gambar u panjat pokok? ;) i pun tak pernah pergi apple picking. not raelly a fan of apple. durian picking ok! oolala! lol!